Early use of automated external defibrillators (AED) increases survival in cases of out-of-hospital cardiac arrest (OHCA). 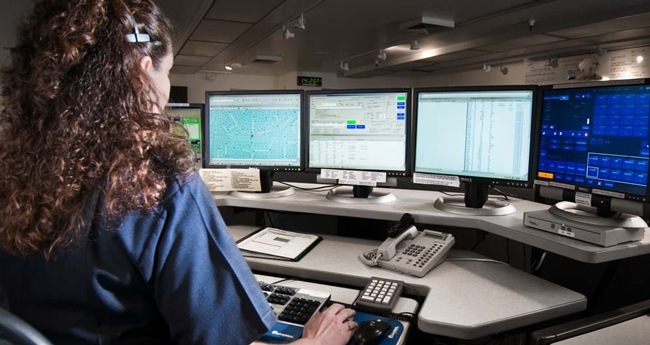 Dispatchers play important roles in identifying OHCA, dispatching ambulances and providing callers with telephone-assisted cardiopulmonary resuscitation. Guidelines recommend that AED registries be linked to dispatch centres as tools to refer callers to nearby AED. The aim of this study was to investigate to what extent dispatchers, when provided with a tool to display AED locations and accessibility, referred callers to nearby AED. An application providing real-time visualization of AED locations and accessibility was implemented at four dispatch centres in Sweden. Dispatchers were instructed to refer callers to nearby AED when OHCA was suspected. Such cases were prospectively collected, and geographic information systems were used to identify those located ≤100 m from an AED. Audio recordings of emergency calls were assessed to evaluate the AED referral rate. Between February and August 2014, 3009 suspected OHCA calls were received. In 6.6% of those calls (200/3009), an AED was ≤100 m from the suspected OHCA. The AED was accessible and the caller was not alone on scene in 24% (47/200) of these cases. In two of those 47 cases (4.3%), the dispatcher referred the caller to the AED. Despite a tool for dispatchers to refer callers to a nearby AED, referral was rare. Only a minority of the suspected OHCA cases occurred ≤100 m from an AED. We identified AED accessibility and callers being alone on scene as obstacles for AED referral. Spencer WOW, what’s going to change in patient transport?